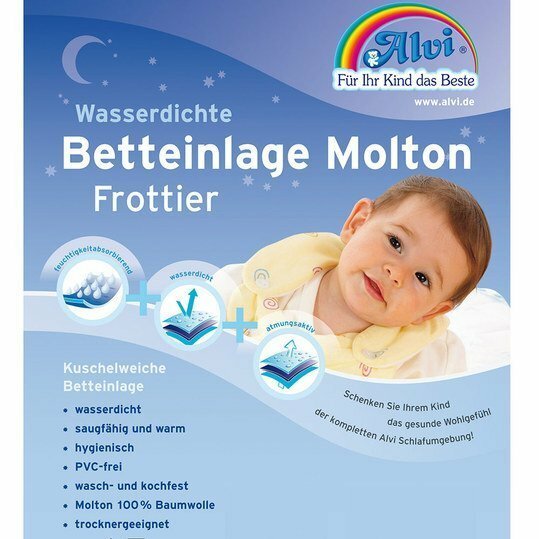 The white bed pad Molton - Terry 50 x 70 cm from Alvi is a particularly absorbent and waterproof mattress protector. You can simply place the insert over your child's mattress and place the fitted sheet over it. The bed insert reliably protects the mattress from wetness and thanks to the Molton coating your darling cannot get sore. If required, the molton insert can be easily washed in the machine up to 95° C and then dried in the dryer - so it is ready for use again in no time at all.